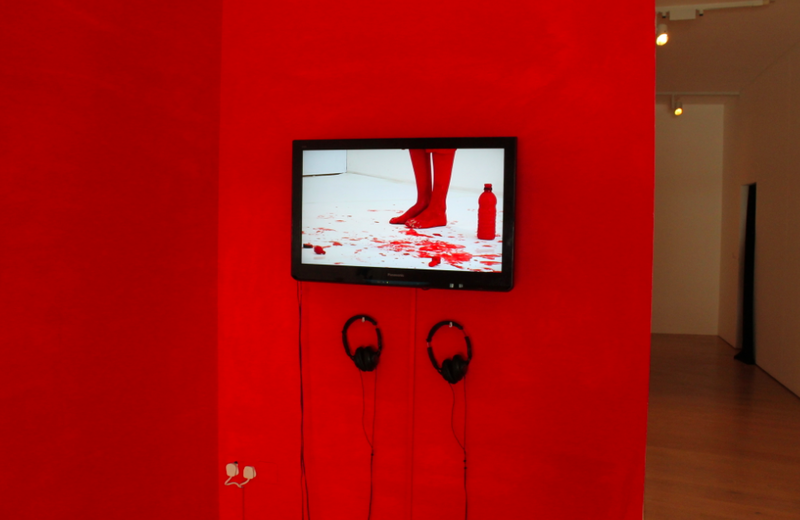 ‘Subversion to Red’ Installation view Table, wood, red paint, white crayon, 300×300 cm. 2 videos, 18 and 11 min. colour, loop. 2013 Commissioned by Calvert 22, London. Subversion to Red is a project that fosters a search for new forms of socio-political organsiation by revisiting certain concepts and societal forms from the past. In Soft Subversions: Texts and Interviews, 1977-1985, Félix Guattari points out that ‘Capitalism only selects and economically valorizes those things that fit its specific needs’. Thus it follows that (not capital letter) capitalism may only produce motivation by calling upon incredible levels of cruelty. In contrast, this project encourages a return of the idea seeking to revive the notion of idealism in contemporary society as an alternative form of motivation. It asks whether it is possible to re-visit and revive some of the ‘old’ concepts, re-activating them for our own purposes today. Throughout 2012, I followed the events related to the Occupy movement closely. I wanted to learn more about the methods they were using in order to affect selected institutional systems. To my surprise, I did not learn anything from them. In one of the first instances after Occupy’s initial ‘occupations’ of MOMA New York, the museum’s curators publicly asked Occupy to suggest how they might modify the museum’s internal activities in order to fulfill the requests that Occupy was making. In another instance, during the last weeks of Berlin Biennial 7, Occupy were invited by the curators of BB7 to propose new working strategies for the Kunst Werke Institute, inviting Occupy to modify the structure of any one of the institution’s departments. However, perhaps due to Occupy’s lack of awareness about the inner workings of the institution – divisions of labour, workloads and the specific dynamic of their in-house processes – they were unable to propose anything relevant. In this instance they were unable to meet the core aims of their own fight. Nevertheless, what I learned through this process – something that motivated me to start working on this project – is the following: first, conceiving how to change things. In order to create valuable tools for relevant change today, it seems necessary to investigate a history of alternative social / political arrangement. Secondly, I learned that art institutions are often open to revising their internal working methods; to consider and introduce changes, in order to propose new social/societal models. These two aspects are fundamental for the project Subversion to Red, which has been conceived almost as a ‘five-year plan’, where a number of activities (conferences, actions and performances) will be enacted in order for a final goal to be achieved. The aim of the project is to find ways in which the idea of (not capital letter) socialism, or Marxism could be re-introduced in contemporary society. Through a process of reviving certain socialist / Marxist ideas and strategies, the project aims to apply those postulates within present-day working environments. In the particular case of Subversion to Red, the chosen working environment is that of the art institution (and cultural environments more broadly), as these are often open to revising their internal working methods and to consider the possibility of introducing changes as a way of testing new social / societal models. This project is not interested in large-scale revolution, or the performative aspects of public / street revolutions. It is based on the idea that change should come from within, and by carefully following predetermined steps that might work in different ways towards re-shaping individual or public opinion. Red Discussion is conceived as a discussion between relevant thinkers and theorists who are invited to analyse and critique various concepts within socialist / Marxist theory. The goal of these discussions is to raise the possibility of reactivating certain ‘historical categories’, while bringing an element of discursiveness (delete) from within the realm of socialist / Marxist theory. The aim is to deconstruct former models (those no longer relevant to current social and political structures) and to propose aspects within them that may still be applicable today. This second stage aims to point out the validity of certain socialist / Marxist postulates for contemporary society. Newly created artworks will revive these ideologies, by re-enacting excerpts from various speeches, books or films, in the form of performance or video-performance. When stages one and two have been familiarised (i.e. when a level of public knowledge and ideological belief in them has been augmented), a third step could then be applied. Concretely, the application of these new strategies would be tested within art institutions, by proposing to modify their internal working structure and strategies. The art institution(s) would work according to these modified strategies, supported by employees’ internalisation and appropriation of these ideologies. Red Discussion is part of Subversion to Red project. Red discussion is conceived as a discussion between relevant thinkers and theorists who are invited to analyse and critique various concepts within socialist / Marxist theory. The aim is to deconstruct former models (those no longer relevant to current social and political structures) and to propose aspects within them that may still be applicable today. During the event, various ideas and key words have been written onto a pentagonal table, which served as the platform to build up and define a set of key concepts and ideals that could be used as a guide for redefining the contemporary society. Red-iness is a series of video performances that explore the idea of ‘time collapse’ and the applicability of past concepts in the present. Redi-ness – Gestalt (2013) presents the re-enactment of a speech acted by Milena Dravić in the film W.R. Mysteries of the Organism (1971), directed by Dušan Makavejev. Commissioned by Calvert 22, London. Red-iness is a series of video performances that explore the idea of ‘time collapse’ and the applicability of past concepts in the present. Early Works was conceived as an attempt to re-introduce Marxist ideals to the demoralised, devalued and unsophisticated form of Socialism that existed in former Yugoslavia in the 1960s. Similar re-appropriations of certain motivational speeches were carried out in public life at the time. For example, Žilnik filmed actor Stevo Žigon addressing students in Belgrade during protests in 1968, capturing him re-reading Maximilien de Robespierre’s famous speech from the French Revolution. In Žilnik’s film and Žigon’s speech we witness how certain concepts can be applicable and become a driving force for change in different times and conditions. A new video work presented at Calvert 22 embodies this process, whilst raising the question of how far these re-enacted speeches might still be relevant today. 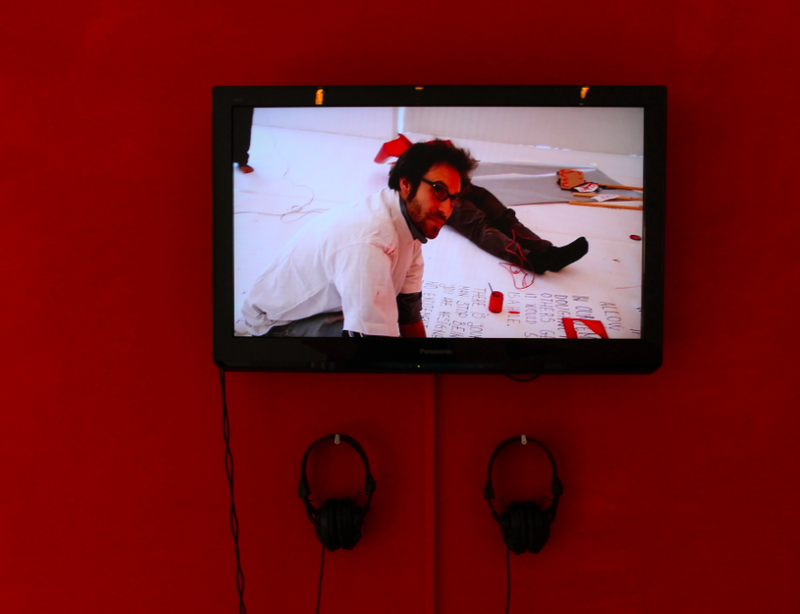 ‘Subversion to Red’ Installation view Table, wood, red paint, white crayon, 300×300 cm. 2013 Commissioned by Calvert 22, London. Red iness – Gestalt Part of the project ‘Subversion to Red’ 2013 18 min, colour, loop. Commissioned by Calvert 22, London. “…Nada Prija’s work is part of a five-year-plan that proposes to “revive the notion of idealism in contemporary society as an alternative form of motivation”, and she is equally concerned with the principle of “reactivating” – in this case old socialist forms of organisation. She explores these through the art institution, a platform she finds open to revising its internal working methods. For Calvert 22, she has curated a public event, the Red Discussion, where five thinkers discussed Marxist theories in the aim to deconstruct former models and flesh out aspects that may be applicable today. The resulting ideas were written over the surface of a pentagonal table, and for the duration of the exhibition visitors are welcome to add thoughts.